Benjamin Franklin is likely to be the first person to have thought about Crop Insurance. Based on a severe storm of 24th October 1788 in French countryside which destroyed crops, he observed – ‘I have sometimes thought that it might be well to establish an office of insurance for farms against the damage that may occur to them by storms, blight, insects etc. 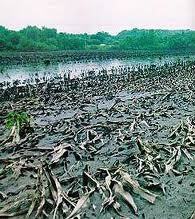 A small sum paid by a number of farms would repair such losses and prevent much distress’. The first crop insurance programme in the form of hail insurance started in 1820s in France and Germany for Grapes, while it started in USA in 1883 for tobacco crop. The earliest Multi-Peril Crop Insurance (MPCI) started in USA in 1939, with formation of Federal Crop Insurance Corporation (FCIC). In India although a few concrete ideas were documented between 1912 and 1920, the crop insurance programme, albeit as a pilot become a reality only during 1972!! Crop Insurance is a tool for protection against loss or damage to crops due to natural calamities and other specified non-preventable risks. It is a financial mechanism in which the uncertainty of loss in crop yields is minimized by pooling large number of uncertainties that impact on crop yields so that the burden of loss can be distributed. World over, there are two broad categories of crop insurance - crop-yield insurance and crop-revenue insurance. • Crop-hail insurance This is among the earliest forms of hail insurance from an actuarial perspective. It is possible to implement the hail risk into financial instruments since the risk is isolated. It is generally available from private insurers (in countries with private sectors) because hail is a narrow peril that occurs in a limited place and its accumulated losses tend not to overwhelm the capital reserves of private insurers. • Multi-peril cro p insurance (MPCI): Coverage in this type of insurance is not limited to just one risk. Usually multi-peril crop insurance offers hail, excessive rain and drought in a combined package. Sometimes, additional risks such as insect or bacteria-related diseases are also offered. The problem with the multi-peril crop insurance is the possibility of a large scale event. Such an event can cause significant losses beyond the insurer's financial capacity. To make this class of insurance, the perils are often bundled together in a single policy, called a multi-peril crop insurance (MPCI) policy. MPCI coverage is usually offered by a government insurer and premiums are usually partially subsidized by the government. U.S. Department of Agriculture is known to implement the earliest Multi Peril Crop Insurance program in 1938. Federal Crop Insurance Corporation managed this multi-peril insurance program since then. The Risk Management Agency (RMA) is active in calculating the premiums based on individual risk factors since 1996. National Agriculture Insurance scheme (NAIS) in India is of this category. 2. Crop-revenue insurance: Crop-yield times the crop price gives the crop-revenues. Based on farmer's revenues, crop-revenue insurance is based on deviation from the mean revenue. RMA uses the futures prices on harvest-times listed in the commodity exchange markets, to determine the prices. Combining the future price with farmer's average production gives the estimated revenue of the farmer. Accessing the futures market offers enables revenue protection even before the crop planted. There is a single guarantee for a certain number of dollars. The policy pays an indemnity if the combination of the actual yield and the cash settlement price in the futures market is less than the guarantee. In the United States, the program is called Crop Revenue Coverage. Crop-revenue insurance covers the decline in price that occurs during the crop's growing season. It does not cover declines that may occur from one growing season to another. In India, Crop Revenue insurance, in a way, is provided by the Government through a mechanism of Minimum Support Price (MSP) for almost 90% of the overall cereal based foodgrains and as such, there is no need for a separate revenue insurance. Agriculture in India despite its relatively diminishing contribution to Gross Do mestic Product (GDP), accounts for over 50 percent of employment, and sustains close to 70 percent of the population. An important feature of the Indian agriculture sector is the large number of small sized landholdings. Of the estimated total 120 million farm-holdings and 63 per cent of farm-holdings was less than one hectare in size, with average holding size of merely 0.4 hectares. Because of the dominance of the monsoon, India’s climate and weather risk exhibit the heaviest seasonal concentration of precipitation in the world. Nearly 2/3rd of the land is rain-fed, and almost 20 percent of India’s total land area is perennially drought prone. The Ganges-Brahmaputra and Indus river systems are highly prone to flooding. The magnitude of flooding, despite all the claimed measures, has actually increased in recent decades, from approximately 19 million hectares in fifties to 40 million hectares in 2003 which is about 12 % of India’s geographical area. As a result, the production risk continues to the most important one. Indian agriculture is often and rightly termed as ‘gamble of monsoon’ and is characterized by high variability of production outcomes. Many external and internal factors during crop cycle make it almost impossible for farmers to predict with certainty the amount of output that the production process will yield. (i) Program based on ‘individual’ approach (1972-1978): The first ever crop insurance program started in 1972 on H-4 cotton in Gujarat, and was extended later, to a few other crops & States. 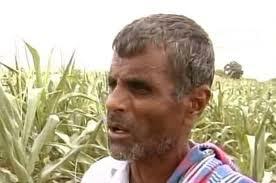 The program by the time its wound up in 1978, covered merely 3,110 farmers for a premium of Rs. 0.45 millions and paid claims of Rs. 3.79 millions. (ii) Pilot Crop Insurance Scheme – PCIS (1979-1984): PCIS was introduced on the basis of report of Prof. V.M. Dandekar and was based on the ‘Homogeneous Area’ approach. The scheme covered food crops (cereals, millets & pulses), oilseeds, cotton, & potato; and was confined to borrowing farmers on a voluntary basis. The scheme was implemented in 13 states and covered about 627,000 farmers, for a premium of Rs. 19.7 millions and paid indemnities of Rs. 15.7 millions. (iii) Comprehensive Crop Insurance Scheme – CCIS (1985-1999): The scheme was an expansion of PCIS, and was made compulsory for borrowing farmers. Sum insured which was initially 150 percent of the loan amount, reduced to lower to a maximum of Rs 10,000 per farmer. Premium rates were 2 percent of the sum insured for cereals & millets and 1 percent for pulses & oilseeds, with premium and claims, shared between the Centre & States, in 2:1 ratio. The scheme when wound up in 1999, was implemented in 16 States & 2 Union Territories and cumulatively covered about 76.3 million farmers, for a premium of Rs. 4.035 billions and paid indemnities of Rs.23.19 billions. NAIS replaced CCIS starting from Rabi 1999-00 season, presently administered by Agriculture Insurance Company of India Limited (AIC), (incidentally, I am one of the directors in its Board! )which provides coverage to approximately 35 different types of crops during the Kharif season and 30 crop types during the Rabi season. Till Rabi 2009-10, NAIS cumulatively covered 244.58 million hectares of crops grown by 158.63 million farmers covering a risk of Rs. 1869.110 billions for a premium of Rs. 55.837 billions and paid or finalized indemnities of Rs. 204.37 billions. The overall loss cost (indemnities to sum insured) stands at 10.55 percent. NAIS is the world’s largest area yield index insurance programme. There are some serious shortcomings in NAIS esp. when one looks at it from the farmer's point of view. The basic premise of yield index based insurance scheme is "homogeniety" on the insurance unit, which in NAIS is Tehsil/block/Mandal etc. It often happens that crop in a particular area of that block gets damaged (& not the entire block) and a situation may occur that while the farmer has lost everything, the notified area still has a yield above the threshold level and thus the farmer is ineligible! Also, the claim settlement process is tedious and lengthy, based on a time consuming 'crop cutting experiment'. Further, NAIS is often criticised as a 'Bank Loan insurance' rather than 'crop insurance' as the participation of non-loanee farmers is abysmally low. The Government of India introduced “Modified National Agricultural Insurance Scheme” (MNAIS) w.e.f. Rabi 2010-11 season on a pilot basis in 50 districts in 12 States. Some salient features of MNAIS, inter-alia, include (i) Insurance Unit for major crops is village panchayat or other equivalent unit; (ii) Includes post-harvest losses caused by cyclonic rains are assessed at farm level for the crop harvested and left in ‘cut & spread’ condition up to a period of two weeks; (iii) Individual farm level assessment of losses in case of localized calamities, like hailstorm and landslide; (iv) On-account payment up to 25 percent of likely claim as advance, for providing immediate relief to farmers in case of severe calamities; (v) Minimum indemnity level of 70 percent is available (instead of 60 percent as in NAIS); and(vi) Non-loanee farmers can also be serviced by insurance intermediaries, including micro insurance agents. MNAIS seem to have resolved some of the key shortcomings of NAIS. Besides qualitative improvements like reduction of insurance unit size, prevented / failed sowing benefits, ‘on-account’ payment of claims, individual farm assessment of hailstorm & landslide losses, coverage of post-harvest losses, MNAIS is quantitatively much better than NAIS. However, MNAIS has its own problems. While the Insurance unit for major crops has been lowered to village / village panchayat which is good for the farmers, but it has exponentially increased the work load required for crop cutting experiments (CCEs) and as a result, many States (its they who have to conduct the CCEs) are shying away from the pilot because of the enormity of the workload. Some states have also requested GoI to share part of the cost of CCEs. Moreover insurers also fear that the local pressures on the primary workers (those who conduct CCEs) to show lower yields, affect the actuarial soundness of the programme and it may be worthwhile in the long run to employ technologies like satellite imagery for estimating the yield, which is largely free from human interference.But then, it involves cost. Weather index based insurance caught the imagination of the policy makers at the beginning of 21st century, and international financial institutions such as the World Bank encouraged pilots in low income countries where traditional crop insurance could not take off for various reasons, including lack of historical yield or loss data. The basic purpose of ‘weather index’ insurance is to estimate the percentage deviation in crop output due to adverse deviations in weather conditions. There are crop modeling and statistical techniques to precisely workout the relationships between crop output and weather parameters. This gives the linkage between the financial losses suffered by farmers due to weather variations and also estimates the payouts that will be payable to them. Agriculture Insurance Company of India (AIC) developed a pilot weather risk index-based insurance product in 2004. Building on the existing weather risk insurance products, the Government asked AIC in 2007 to design the Weather risk-Based Crop Insurance Scheme (WBCIS) as a pilot. AIC developed parametric weather risk based crop insurance for a variety of crops ranging from seasonal to perennial crops and low value to high value crops. During 2010-11 as many as 15 States have implemented the pilot programme in 116 districts covering more than 800 Blocks / tehsils. Rajasthan has implemented the pilot in all areas of the State, while Bihar has implemented the scheme in all but three districts of the State. During 2010-11 AIC piloted weather index based crop insurance for over 35 different crops, and as per the estimates, insured almost 8 million farmers with acreage of more than 12 million hectares for a sum insured of approx. Rs. 96.35 billions for a premium of Rs. 88.3 millions. The weather insurance market as a whole in the country estimated to have insured during 2010-11 over 9.27 million farmers for an acreage of over 13.23 million hectares covering a risk valued at Rs.143.00 billions with a premium of Rs. 12.90 billions. There has been a spectacular increase in coverage under WBCIS in the recent years and there appears to be greater awareness and acceptance among the farming community. However, just like any other scheme, there are challenges in WBCIS too. Substantial premium subsidies and the market demand for regular payouts rendered weather index insurance more like a ‘money-back’ policy that pays small amounts of payouts every second or third year, rather than working as insurance product that compensates medium and large losses once in five to ten years. Another grey area is the likely difference in rainfall and weather experience between the weather station location and the farmer’s field. 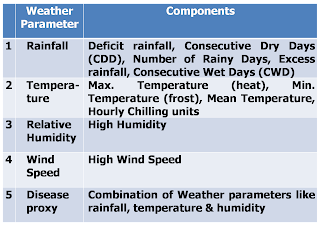 With a weather station being referenced to a radius of more than 10 KM, in the present circumstances there are bound to be differences in weather, particularly the rainfall between the location of weather station and the farmer’s field. The result may either lead to undeserved payouts and vice versa. This problem in index insurance is known as ‘basis risk’. Ideally every village should have a weather station to reasonably minimize the basis risk, which would require almost 50 fold increase in the existing weather station network. Moreover, in order to cover the entire country, a total of 35000 rain guages, and 10000 weather stations are required to have a "weather-grid". It has cost implications and also the issues of security and tempering of these instruements. While the Agriculture crop insurance has increased in terms of its coverage over the years, it remains far low when seen as a percentage of farmers/acreage covered or when compared internationally. During 2009-10, just about 20% of the total cropped area got covered under Agriculture insurance (it is >50% in USA). Of the total coverage, small/marginal farmers, during 2009-10, accounted for 65 percent in terms of number and 43 percent in terms of area insured. Similarly during 2010-11, they accounted for 73 percent in terms of number and 48 percent in terms of area insured. What's however worrying is the very minimal coverage of non-loanee farmers which was a meagre 5% and 3% of total NAIS coverage during 2009-10 and 2010-11. These are the farmers who often dont have access to Bank loans and are often most deserving in terms of their credit requirement and are left out. They are the most vulnerable lot and their being left out is a partial failure of the Agriculture Insurance Scheme as a whole. 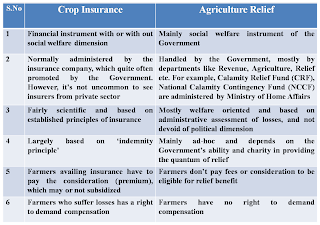 To conclude, whats required is (i) increasing agriculture insurance literacy in a manner where its not simply reduced as a bank loan insurance scheme and actually caters to the vagaries of the uncontrollable; (ii) brings non-loanee farmers in its fold (iii) based on quick & scientifically based assessment and an equally quick dispersal mechanism. The ultimate test of agriculture insurance success will be when it could be based on individual farm unit based and not for the designated notified area.